The WeMos D1 mini PRO is a miniature wireless 802.11 (Wifi) microcontroller development board. 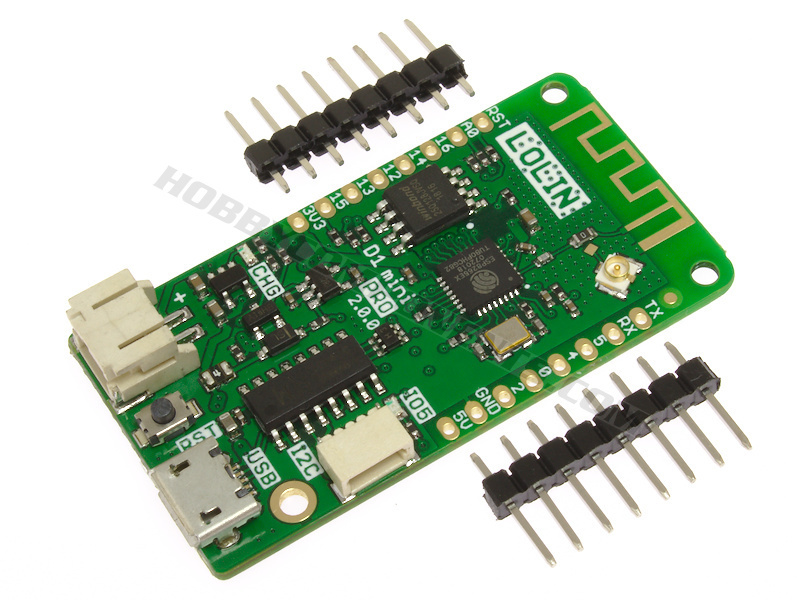 It turns the very popular ESP8266 wireless microcontroller module into a fully fledged development board. Programming the D1 mini pro is as simple as programming any other Arduino based microcontroller as the module includes a built in microUSB interface allowing the module to be programmed directly from the Arduino IDE (requires the ESP8266 support to be added via board manager) with no additional hardware. The D1 mini Pro is also designed to allow Wemos compatible shields to be plugged into the board in a similar way to the Arduino development board platform, which greatly expands its capabilities. There is already a large range of compatible shields available and these can also be purchased via our website. 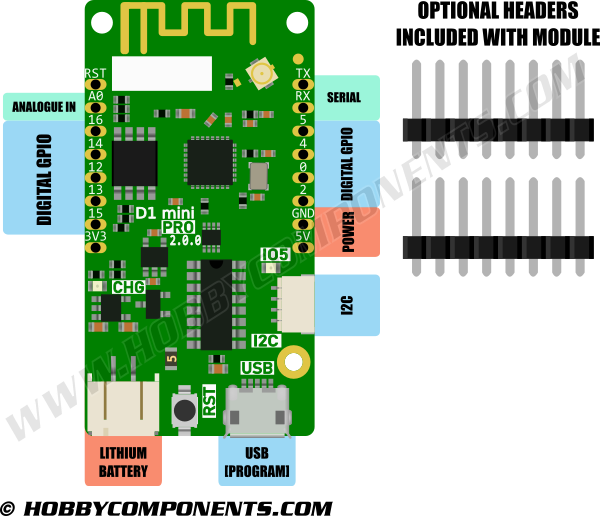 New V2.0 features: This version now includes a lithium battery charging circuit (500mA max) and header which allows the module to be powered from a 3.7V single cell lithium battery. The Wemos D1 mini includes a CH340 USB to UART IC to allow it to be programmed directly from the USB port of a computer. Drivers are available in the link below. Simply download and unzip them, connect your D1 Mini to your computer with a USB cable and when the new hardware is detected, point the wizard to the folder you just unzipped to and it should install without any problems. Download the driver (you must be logged in to download). Then click the OK button to close the window. 4) In the window that opens up look for the entry titled 'esp8266 by ESP8266 Community Version x.x.x' and click on it. 5) In the bottom right-hand corner of this entry you should now see an install button appear. Click on this and board manager will then automatically add all the files necessary to support the ESP8266. This may take a few minutes depending on the speed of your internet connection. 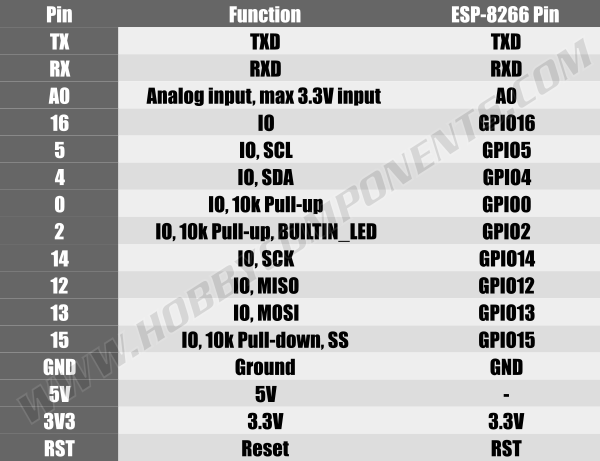 6) Under tools->board you should now see additional board options for various ESP8266 devices including one called 'WeMos D1 mini Pro'.